No topics produce as much discussion--and anger--in junior tennis as wild cards and back draws, known in USTA tournaments as consolation or feed-in tournaments for the 16s and 18s divisions. (The 12s and 14s age groups typically have compass draws in their national tournaments). I'll save the wild card discussion for another time, but it's probably a good time for me to add my two cents on the back draw controversy, which has produced comments both reasonable and emotional to a previous post last week. But before I provide my thoughts on the more subjective facet of the issue, I'd like to start with some numbers. 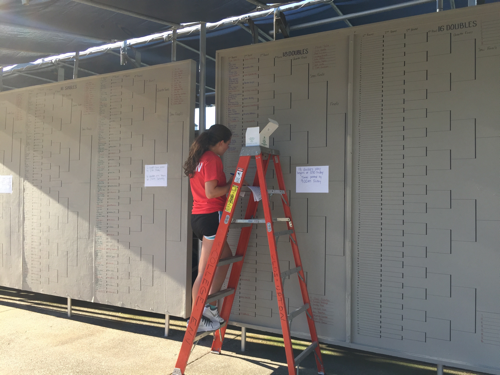 In the 187 feed-in matches scheduled in the 16s during the 2015 Kalamazoo tournament, 10, or 5.3%, were not played. In the 187 feed-in matches in 18s this year, 28, or 15%, were not played. At random, I selected two other years for comparison, to see if this year's numbers are higher, possibly representing a trend. The answer is yes. In 2000 and 2010, the number of 18s feed-in matches not played were both 14, or 7.5%. In the 16s, the number of feed-in matches not played were 5 in 2000, and just 3 in 2005. Obviously, from this admittedly less than rigorous research, the 16s value the points and the matches the feed-in provides more than the 18s do. In my experience, there are as many reasons for withdrawing from the feed-in tournament as there are players, but here are several common ones. When I first began working at the tournament as a volunteer in 2000, I had the same stance I'm hearing from many of you on this issue. No player should pull out unless they were basically in a cast, walking on crutches to see the tournament doctor who was, and is, required to sign their medical release. But sometime seven or eight years ago, I spoke to one of the best player development coaches I know about playing consolation matches (at the Junior Orange Bowl event, which has far more walkovers, with international players returning to their home countries for the Christmas holiday). He said something so simple and wise that I've never forgotten it: "It's another match in your development." I now look at a withdrawal from the back draw through that prism, thinking, I guess John Doe or Mary Smith didn't need that match for his or her development. That relieves me from judging the legitimacy of their injury/illness and allows me to instead focus my attention on and appreciation for the players who have deemed the back draw a place where their development can be enhanced. Players like No. 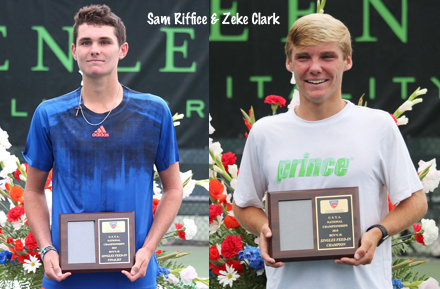 9 seed Sam Riffice, who played nine matches after losing in the second round, winning eight of them, and No. 16 seed Zeke Clark, who won nine matches after also losing in the second round. Players like Danny Thomas, who was in the 16s doubles final, but played two back draw matches the day after he finished as the runner-up in doubles. 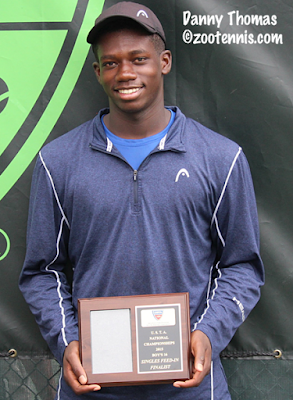 Players like unseeded Sean Hill, who accepted a wild card into the 16s and finished fifth in the tournament. Those players recognize that the back draw has something to offer them, as it did 2015 finalist Stefan Kozlov, who two years ago, after losing in the third round as the No. 3 seed in the 18s, finished in fifth place, posting eight victories. Or Mitchell Krueger, who in 2012, as the No. 1 seed, lost in the quarterfinals, but played three good matches, including one against Kozlov, to win the back draw and finish in fifth place. And if there was ever a candidate to skip out on the back draw, it was Donald Young in 2004. 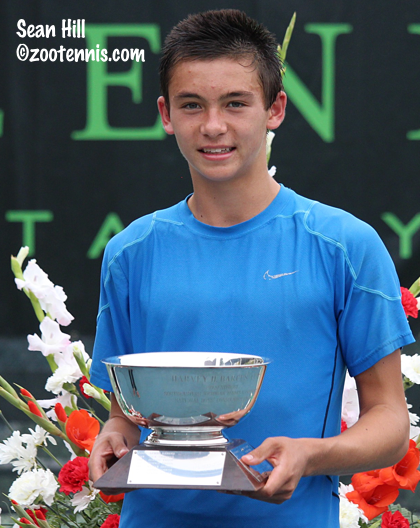 Young, already hyped as the next great US player and already a pro, played the back draw after losing to Clancy Shields in the fourth round in his Kalamazoo debut. He ending up losing to Mykyta Kryvonos in the quarterfinals, but did win four feed-in matches. I hear often that college coaches look at the back draw to learn about a potential student-athlete's competitiveness, concentration and commitment. (It's ironic, and I'm sure disappointing to them, that many of their recruits, once signed, are no longer interested in competing in the back draw). I've narrowed down participation in the back draw to this: an indicator of who really enjoys playing tennis and competing, without all the carrots and the sticks that may obscure that simple desire to just play. The trend against competing in the back draw, if we can presume that exists, is troublesome. After all, the tournament provides the officials, courts, balls and infrastructure based on the assumption that these matches are desirable and useful for the player and will be played. Those costs provide no benefits if the majority do not value the opportunity. I do not think the current numbers suggest major changes are needed, if only because I do not think more rules like the ones the USTA introduced in 2013 (i.e. you must play in your sectional tournament to be eligible for the Nationals) had any positive impact, and in fact, are usually harmful in the federation's goal to promote the sport. Perhaps a fee for withdrawing from the back draw would help recoup some of the costs associated with continuing to hold it, but I can't come up with an incentive that would be likely to increase participation, although I would welcome any ideas. Major league baseball, or baseball at any level, is different from the days before pitch counts, when a starter went out every four days and tried to pitch a complete game. The possibility of overuse injuries in tennis must be taken into account now, and match counts must be monitored, particularly when a major tournament is just weeks away. Professional players are all about optimizing their schedules to peak for major tournaments, and there's nothing wrong with top level juniors and their coaches doing that as well. That's a long-winded way of saying that sport science evolves, and in the end, except for the notable and important exception of doubles, tennis is an individual sport. The drawbacks of the lack of a team infrastructure are many--cost not the least of them--but one of the benefits is a player/coach/family's authority to make the final determination if a competition is productive or detrimental. Those decisions may not always match our own personal perspectives and values, but they must be respected, as they are the ones accountable for the consequences. To correct a few of the misconceptions out there regarding players who are coached by the USTA. None of their expenses were paid by the USTA for this tournament, and no USTA coaches were responsible for any of them while they competed in Kalamazoo. (This might not strictly apply to the newly organized Team USA members, many of whom played in the 16s). Wild cards pay tournament entry fees, just like any other competitor, at all tournaments. I do think the USTA should insist that wild cards they select for USTA national tournaments play the back draw as a condition of receiving that opportunity, and would hope the player's failure to do so would be considered when receiving requests for future wild cards from that player. And one final suggestion: get rid of the 18s third place match in San Diego and Kalamazoo. It's a relic of an earlier time, when the Hard Courts marked the end of the junior tennis season. And after losing out on a trip to the US Open, neither player needs another match, and one of them certainly doesn't need another loss. Not that tennis will ever go this way --- but since a full-feedin is 99% of the way there (all but 3 players have 2 losses) --- what if Kalamazoo switched to a double elimination format? I wonder how many players would go home if they were still in the hunt for the national title/wildcard into the Open? I do wish semifinal losers fed into the backdraw, this way the bronze ball is still up for grabs for everyone after a loss. 85% of backdraw matches were still played in the 18's, where it becomes annoying is people who lose in the Round of 16 and Quarterfinals withdrawing at an alarming rate. That is nothing new though. Other side of the coin......There are no back draw matches at ITF events or pro events. Another reason why more guys could be pulling out of matches in 18s is the level is much more physical than the 16s. Also, over time, tennis (even junior tennis) has become much more physical. As a player who played in these events 20 years ago, I'm astonished how heavy every single junior player hits. The points require much more athleticism nowadays. Your full body is engaged to hit shots now. The coach who mentioned to Colette that each match is a chance for development sounds spot on. Some kids - the back draw won't really help because they have another tournament the next week. Others may benefit greatly by gaining experience. Nothing is black and white. Most of the people who are "outraged" are people who's kids are not in the top tier. Their goals could be to get their child into a nice Div. I University. Many other players have the goal to be professionals now, or this year. Different for everyone and no one has the "right" answer for all. Colette's pitch count analogy to baseball should be looked at closer. With the increase of physicality in tennis today, matches in many people's opinion may be too long and the season too long. All junior players are playing with poly string from a young age, albeit with lower tensions than years past. Poly string lacks the feel and flexibility that synthetic gut and guts strings used to provide. Could there be any long-term affects from playing with poly from day one? Colette, thank you again for your passion for the sport. Very few people outside of the core tennis fans care about the game and it's wonderful when ideas are shared. Hopefully, tennis can evolve and be forward thinking so that the game can grow. Change requires taking risks. That's why many applaud the NCAA for trying something new. It may not be "right," but at least the coaches and AD's know resources are finite and they will allocate to the sports that draw attention to their Universities. I hope tennis can stay relevant in top DI. Tennis has been tremendous for many of our lives and I'd hate to see the popularity fall in the US(like baseball and golf) for future generations because we don't want to disrupt the "integrity of the game." Also, backdraw doesnt even have a 3rd set anymore, so shorter matches. Colette, Thanks you for this post. However, the issue of withdrawing from singles (even with medical excuse - apparently it taes very little for the tournament dr to agree to this) and yet continuing in the main draw doubles is not addressed. You want to withdraw and go home for whatever reason - okay up to you (if not really in the spirit of entering). You withdraw for a medical reason one might be skeptical about and stay to play doubles, absolutely no in my opinion. One solution is to make back draw matches 8 game pro sets, no ad scoring, (similar to college scoring) Matches would be shorter, different type of development, can play 3-4 matches per day, requiring less days to complete. I do agree with higher expectations for wildcard players. They for whatever reason didn't do the work to get in on their own. They might be good enough to be there but maybe so was the person that didn't get in whose spot they took. And I agree that the decision to withdraw is a personal one which may have a lot of factors. The part that has always rubbed me the wrong way are those that frequently skip out on backdraws. In many of the computer based rankings, UTR and TRN, playing backdraws are almost all risk. Those that are acutely aware of this strategically duck the risk and keep their rankings inflated just a bit. Are they good players? Sure they are. But I think a kid that says, "I'll play anyone anywhere and let's the chips fall where they may" deserves a bit of a boost/credit. In the long run, that's the kid that will go further in life. In the short term, they are often looking at the backs of kids that inched ahead of them by ducking a backdraw loss in the TRN/UTR ratings. Easy way to fix that - TRN/UTR should count a default as a loss, no different if they played the match. Yes, that hurts the guy who is legitimately injured but that should balance out over time such that it is a wash for everyone. I actually don't think that is why most guys default but would be a logical change regardless. It's clear that the percentage of withdrawals in the consolation draw has increased slightly over time (1-2% in the past decade), but it's not really clear why. For those that think that the ranking system is the reason, the USTA transitioned from STAR (a head-to-head system) to Points-Per-Round in 2004-05. The percentage of withdraws in the back draw grew from 1% to 5% before the transition, hovered in the 5% to 6% range for the next 5 years, and has been in the 6% to 7% range for the last 5 years. So I don't think it's algorithm dependent. Also the number of withdrawals in the main draw has increased slightly over time. Starting in 2000, the number of withdrawals in the consolation has consistently been around 1.5 to 2 times greater than the number of withdrawals in the main draw.